Showers are possible alongside thickening clouds Thursday and Friday, with bands of heavy rain on the way for Saturday. So far, this week has featured decent weather — breaks of sunshine and comfortable (although below-normal) temperatures. That is about to change as our atmosphere prepares to receive our next storm system that will impact the Garden State on Saturday. Thursday morning is starting with scattered clouds and temperatures mostly in the 40s. (50s in South Jersey and along the coast.) Clouds will increase quite a bit by late morning Thursday. While our weather is dry for now, I can't rule out a few showers as the day goes along. High temperatures on Thursday are forecast to reach the lower 60s, certainly cooler than Wednesday and about 10 degrees below normal for mid-May. Winds will remain light throughout the day. Again, a few raindrops will be possible Thursday night. And Friday too, as rain chances continue to rise. Friday will be a cloudy and cool day, with morning lows in the mid 40s and high temps limited to the mid to upper 50s. The most active and wettest day in this forecast period, by far, is Saturday. Confidence is growing that it's going to be a real soaker, as a powerful storm system — technically a nor'easter, I guess — pushes across New Jersey. It will have sufficient moisture to produce bands of heavy rain. And easterly winds may drive some water toward the Jersey Shore. Let's start with the rain. As of now, I'd peg the steadiest rain to fall between about 5 a.m. Saturday and 2 a.m. Sunday. 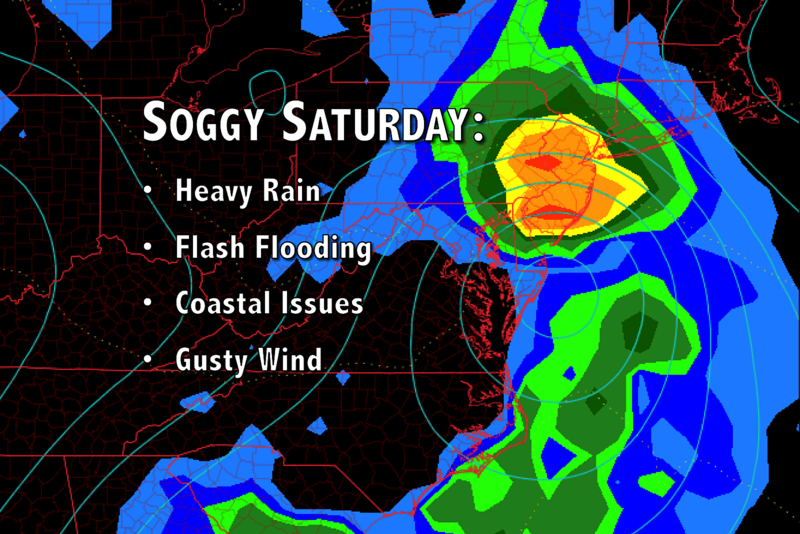 The heaviest downpours will happen Saturday afternoon. Widespread 1.5 inches of rainfall is a good bet. Areas of more than 2.5 inches of rainfall will be possible where it really pours. That's a lot of rain! Exacerbating the heavy rain is a pretty wet "antecedent" condition. In other words, it's been a pretty wet May so far — Newark, Trenton, and Atlantic City are all running above-normal for month-to-date rainfall. If the soil is already partially or fully saturated, flooding can occur quicker. So, we'll face the usual heavy rain threats: poor visibility and traction, ponding of water on roadways, and potential flooding of low-lying areas. Thunder and severe weather seems unlikely at this point. Additionally, we're still watching the coast very carefully. A period of easterly winds will almost certainly drive some water toward the Jersey Shore. But the timing of that ocean surge will be very important in dictating any potential flooding impacts. If it happens at low tide, only "minor" flooding will occur. If it happens at high tide, impacts may creep into the "moderate" category. I'll compile more details on forecast tide levels in the next 24 hours. As the storm system pulls away from the East Coast Sunday morning, showers will end (by around 10 a.m. at the latest) and skies will begin to clear (to at least partly sunny). So your Mother's Day will look a lot nicer than the day before. High temperatures will recover too, bumping to around the mid 60s by Sunday afternoon. The only real weather issue for Sunday will be a strong northwesterly wind, gusting to 30 or 40 mph. Monday looks gusty too. I've held my forecast temperatures below forecast model guidance as a result, in the upper 60s. Tuesday looks breezy. But sunshine will help warm temps into the lower 70s. And then Wednesday... Boom! Mostly sunny skies, a dominant southwest wind, and a dry forecast will combine to help temperatures to soar to near 80 degrees for the middle of next week. The warmup you've been waiting for! Will the warmth last? Eh, we'll see. Odds are good that a cold front or backdoor front will knock back temperatures again by next weekend. Even so, hopefully this will be the beginning of a warmer overall pattern as the Memorial Day Weekend rapidly approaches.